Luigi Gattinara, artist born in Rome but based in Milan and an international past, talks about his career and his artistic concept through the issues related to MyTemplArt® project: the importance to catalog, safeguard, enhance and certify the artworks, the relationship with new technologies and his next experience to MIA Photo Fair 2016. Paola Sacconi: Do you have a your archive? When did you start cataloging your works? Luigi Gattinara: The archive has always been a drama in some ways, especially in the early years of my career. Many artworks didn’t be archived for organizational and unconsciousness problems. I didn’t think in any way, now I regret it bitterly because many interesting things are lost. Then I gradually began to prepare an archive, especially when I started to create images for me, those I call my Fine Art images, the images dedicated to a different market from advertising, where I worked for many years and I keep working. They are the images of my free expression, of my creativity. And then I started to have the problem of being able to catalog them not so much as to give a progression: for every sold work I kept number track but not format one. I talk about the format because when I started to approach the concept of photography as an art form, there wasn’t the Fine Art. My ideal was the photos were to remain almost unique works, so my policy is to produce 10 pieces of each work regardless of the format. A standard that I still hold; perhaps it is not very convenient from a commercial point of view, but it’s a winner from a historical point of view. I think if you would like to own an artwork, you also wish it’s something anyone don’t have. Therefore it is important to have the possibility to certify and historicize your artworks because otherwise you lose the memory of yourself, you don’t leave a trace. Sometimes I go to pull out the few things I left, and that allow me to remember my career, it is vital! P.S. : How is it important to safeguard your work? How do you guarantee uniqueness and authenticity of your artworks? Luigi Gattinara: As I said, it is important to leave a trace. Each track must be authenticated, because if you don’t certify it, this track is repeatable with fakes over time. An example is the bronzes history: through plaster casts, bronze artworks were reproduced in serial level even after the artist’s death. It goes against the idea of the artist, in one piece and become a copy, a worthless fake. So what is the good thing and the false one? You lose the real track, the stretch of history. I am very careful about these stages. Of course when I have to print, I deliver a matrix to printers, but for me it is vital to have a printer of extreme confidence, with which I can empathize, a serious person who destroys the file after printing, to ensure the uniqueness of the artwork. In the photography it’s even more complex, in addition to the signature is required to authenticate the print run, the press and the artwork through an accurate Certificate of Authenticity that is a guarantee for the artist and the buyer. I don’t want the posterities certify my work only through economic fee. The arts of the twentieth century are full of such cases. P.S. : Does the photography have more authentication problems than other artistic disciplines? Luigi Gattinara: In 1986-88, when I return in Italy, fascinated by the sixteenth century suggestions, I made my first exhibition with Rossana Bossaglia who fell in love of my artworks, I was flattered. As anticipated, I began to have the problem that every my photo in that segment of market had to be secured and authenticated as other artistic disciplines. Rossana compliments me, when she said: “between a painting and a photo there is not a big difference: you, Luigi, don’t use the brush but you paint with light“. In fact all works, regardless of the medium, start from a perception in your head. Indeed, often the photo has problems the painting doesn’t have. 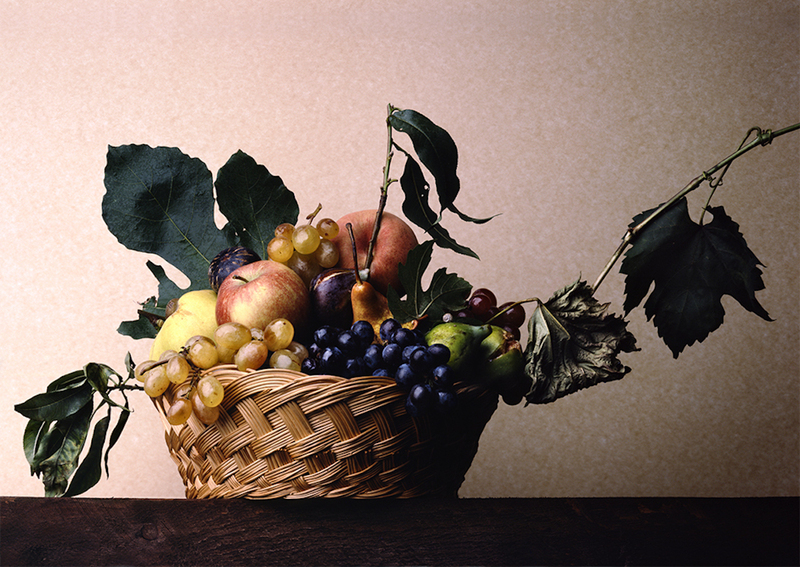 For example in this first exhibition, I made an artwork called “For fun” [Cover image], the only copy of a painting I made in my life (“Basket of Fruit” by Caravaggio stored at the Pinacoteca Ambrosiana in Milan). For me it was a real game try to rebuild the painting in the studio; when I placed the fruits in the basket acquired completely different volumes from we perceived in the Caravaggio’s masterpiece; so I had to disassemble, cut them to rebuild the original composition. The optics and volumes change. In addition, the work is without retouching, I tend to do not the post-production work unless it is wanted. When I create images for the Fine Art the element, that definitely I don’t edit and I will never edit, is the light. Everything else, however I try to not edit. P.S. : Raising awareness to the issue of the Certificate of Authenticity at the time of purchase is relatively recent. Do you think is related to the need to regulate better the art market? is it a change of mentality? A responsibility towards the artists? In addition, in relation to the chaotic world of photography, such as safeguarding the value of your artworks? Luigi Gattinara: I think the critical situation of Certificate of Authenticity in photography was born from the main problem that photos are reproduced in series. Therefore it is essential to certify to solve the problem immediately: all that is outside of the certification, it’s zero. Richard Avedon deleted all tests and rejects with a paper knife, the only system at the time to have the property of his artwork. Today, in the digital age, the phenomenon has become much more complex. You have two ways to have a guarantee to be not robbed of your work: first the certification; second having trust printers that delete the original file when the artwork is printed. Industrial production is another thing, it affects cultural and economic value of the artwork, distorting it from its true meaning of unique. In particular, the world of photography is a disaster, it is not regulated by national or international standards. In my case, if my artwork is ruined, the collector can send me it and I give back the new one, on the same format and with the same numbering. So the declared edition is still the same for those works. The common trend is to produce various editions for different formats. I prefer to go beyond the size: an edition 1/10 of any product size so it is still considered an unique artwork. I try to free the photography from his great Damocles’s sword: the seriality thanks to the certification of a one-run and limited edition. P.S. : What impact does the digital have on these aspects in photography? Luigi Gattinara: Today the digital technology has destroyed part of the old photography; I refer to a root of thought. When the analogue era was finishing and the digital one was starting, I too felt in crisis. Many colleagues have abandoned the world of photography. However, I am convinced photography is an expression of composition, light and my vision. If we change the medium, what happens? Nothing. Indeed the technological evolution allows me to improve its representation. The base is the man, his creativity and his sensitivity, not the medium. The technology also allows us to offer new guarantees to the buyers as the certification through the use of a QR-Code *. Also with a cloud cataloging system as MyTemplArt®, you can guarantee the constant control of the original artworks by the artist. P.S. : During MIA Photo Fair 2016, four of your artworks will be exhibited at MyTemplArt® stand (hall 2 stand B). What artworks will you exhibit? What do they represent? Luigi Gattinara: MyTemplArt® project fascinated me from the beginning. I find the technology for supporting the art system and its processes an extraordinary idea. So, when I was invited to exhibit at MyTemplArt® stand and become a supporter of the project through the use of certification services offered by the platform, I was happy and honored to participate. In particular, I chose four artworks that represent four different subjects and ways of interpreting the photography. 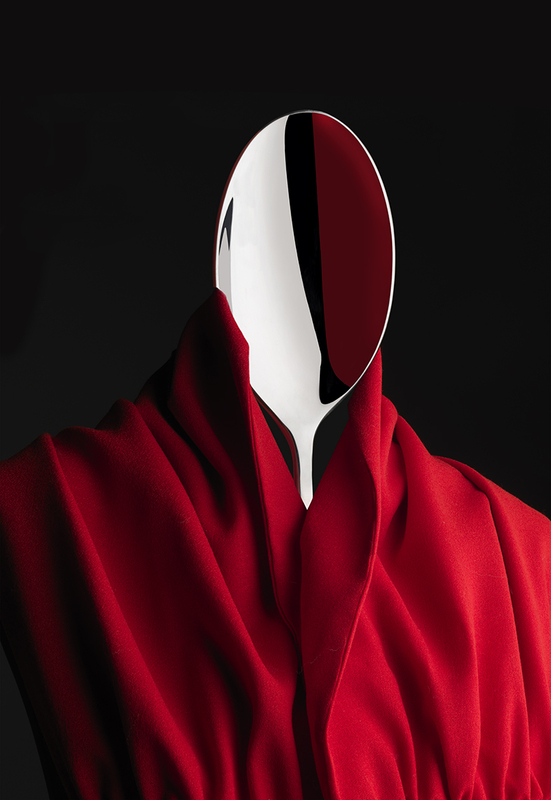 Stanislaus Spoon and Ludovica Fork are the development of an old communication concept on which then I created a world composed of two characters, male and female. 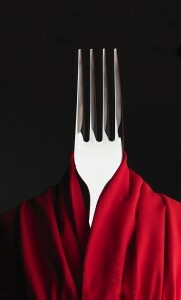 A way of making metaphysical portraits, represented by a spoon and a fork that identify a man and a woman by their structure. The woman was born before the man but the name was given first to the man and then to the woman. Stanislaus is a very dear name for me, it was the name of the brother of my grandmother: Stanislao Lepri, painter. Why Ludovica? Because it goes well with Stanislaus! Eva was born when a friend who paints hands called me and told me that he had finished a watches campaign with a model with hands painted as a snake. He told me that if I could invite her in my studio for some shots and I accepted. 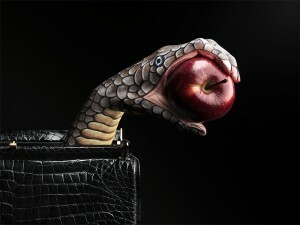 I made some instinctive shooting on this shake hand: bag, apple, temptation. The trivial name Eva comes after the shot. The act created the composition. Impressive: the photography is repeatable but not reproducible. Now I’m not able to re-do the work I did because they are linked to a moment, a feeling and a single gesture. 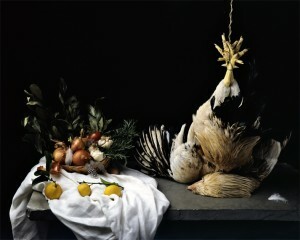 Finally there is Still life with feathers. I chose the capon of the painting, announcing his death. A difficult choice, but I think I’ve given to that animal a great dignity, giving it the eternity. A bird that I was not able to eat, so I gave it to the porter. Around the eternal sleep of the capon, I composed a world that I called “still life with feathers”: it is not the death of the capon but its feathers are the true subject of the artwork. P.S. : Do you use web tools and social media platforms to promote yourself? What is the value of these communication channels for you? Luigi Gattinara: I don’t know how to use them but I use them. How many times we give a “like” on a fanpage just because a friend asks it? So what is the value of that “like”? None. And in some social media platforms where you can buy likes, why have them if they are not the expression of a real like? Social networks are exciting, they are the present, a fantastic tool for global communication, a way to promote ourselves and share our thoughts, but they must be used with moderation and awareness. If they are managed well, they are an incredible way to communicate in a click with the world. Every time I look my website analytics and I see it was visited by people from over the world; it excites me. I work in advertising from 1969-70 and I have always supported advertising could be a medium to grow up the culture of people giving messages that aren’t just commercial, but also of high quality. We have a duty to promote culturally high and evolved content. Today there are social media platforms, a fantastic medium that allows you to distribute content at the highest level. Friday, April 29th at 6 pm in MIA Photo Fair, MyTemplArt® will present these services during the talk Certify the authenticity of artworks. The technology supports “art” system. The artists Luigi Gattinara and Alex Pinna will talk about the certification and the importance of ensuring the authenticity in the artistic sector. Gianni Pasquetto, MyTemplArt® General Manager, and Paola Sacconi, MyTemplArt® Communication Manager, will analyse Project advantages in relation to these topics. * Luigi Gattinara is in MyTemplArt® (www.mytemplart.com) and releases Certicates of Authenticity with the process for requesting and release patent by the platform. He uses Qr-Code MyTemplArt Authentication System to ensure maximum protection for his clients. For all informations about new services of Certification offered by MyTemplArt®, read the article http://news.mytemplart.com/mytemplart-revolutionizes-the-authentication-process-of-the-artworks-at-mia-photo-fair-2016-in-milan/.